Holidaymakers looking to see in the new year abroad will find the cheapest prices in the Czech Republic capital. Revellers partying in the fashionable city of Prague can enjoy a night out for as little as £42.90 per head. This makes it the least expensive destination of six cities surveyed by foreign exchange company Travelex. The cost was based on the typical price of a night-time dinner, entry to fireworks shows, one beer (pint) and a celebratory bottle of bubbly. Wherever in the world you are seeing in 2015, it pays to have the peace of mind afforded by trusted travel insurance. With nearly a quarter of Britons favouring to spend December 31 overseas, the choice of destination and its cost is important. And Budapest may be high on tourists' go-to list, offering the same package for £66.81 per person. Those after a more traditional winter break can also find a good deal in Toronto, Canada. Fans of New York's spectacular New Year's Eve pyrotechnics can enjoy the same items for an average £118.60 - still around a third of the price for the same package in London. 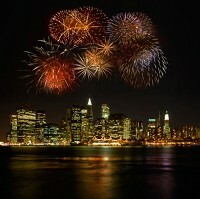 Three in 10 of the 2,000 adults polled said they would prefer to spend December 31 partying with New Yorkers. The English capital charges visitors an average of £336.14 for similar services, making it among the planet's most costly destinations in which to spend December 31. At nearly £100 less expensive than London, Paris offers a similar December 31 entertainments package for about £245. Travelex chose the six destinations as they are all inside six hours of London by plane.